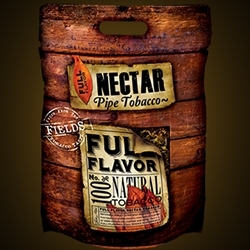 Nectar Pipe Tobacco is a 100% Native American natural pipe tobacco introduced on the market by the Seneca Manufacturing Corporation. This high quality tobacco is ribbon cut and air-cured infused with an essences that provides a fine draw and an even burn. Each flavor of Nectar Pipe Tobacco brings a taste that’s been carefully created to give a truly authentic natural tobacco experience. This superior tobacco blend is an ideal choice or any novice or experienced smoker. Nectar Pipe Tobacco packs nicely into your favorite smoking pipe, stays lit easily offering an all-day smooth and mellow taste, with pleasant aromatic room notes. A solid value as a pipe smoker’s best friend. Try this Nectar or the god’s today right here at Smokers Discounts. Nectar Pipe Tobacco is manufactured and distributed nationwide by Seneca Manufacturing Co., Salamanca, NY, Seneca Nation USA. Each pouch of Nectar Pipe Tobacco are available at our online tobacco store in unique styles to choose from. Full Flavor, Light and Menthol. Choosing this premium tobacco for your everyday smokes is a great alternative to expensive and over-priced retail brands. Here at Smokers Discounts we’ve made it easy and affordable to buy pipe tobacco online. Call us for more details!